I wanted to blog about Parenting Without Power Struggles because I loved the idea it was pitching – “This isn’t about parents being in control; it’s about being in charge.” To set up this concept, Susan Stiffelman uses the analogy of a Captain and his ship. Stiffelman argues, while it might be fun to dine together, no passenger wants to hear the Captain running around on the deck screaming about how the boat has a leak. Therefore, she believes, parents must also remain steady and calm – regardless of their moods or behaviors – so that their children can relax, like the ship’s passengers, knowing they can rely on us, the Captain. Building upon this great idea, Stiffelman uses different images of hands as a simple model for understanding who – if anyone – is in charge at your house. When the right hand is positioned about the left, the parent is in charge. When the hands are side by side, no one is in charge. She refers to this as ‘two lawyers’ because this is when power struggles take place. Focus on loosening your need for your child to behave properly so that you can feel you’re a good parent. Let go of the drama and threats that simply emphasize how out of control you’ve become. Come alongside your child, rather than at him, so he feels you’re his ally and advocate. 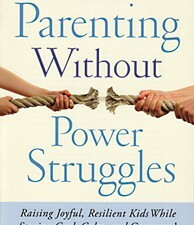 Parenting Without Power Struggles believes that you must not only stay calm but also connected. As a result, Stiffelman devotes considerable attention to the child’s need to attach. 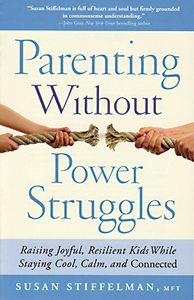 “The best insurance policy parents can ‘buy’ to ensure their children will grow up to be healthy and resilient is to forge and maintain strong emotional connections.” After detailing the six stages of attachment – proximity, sameness, belonging, significance, love, and being known – Stiffelman offers numerous ideas for strengthening the parent-child relationship, without forfeiting your role as the person in charge. So I’m going to try to maintain my cool the next time we hit rough seas, in the hopes of fully inhabiting my role as Captain. Maybe, it’ll keep us all from grabbing a lifejacket and jumping overboard by the end of summer vacation. Read my other blog Befriending Forty and find out what happens when the person you thought you’d be meets the person you actually became.